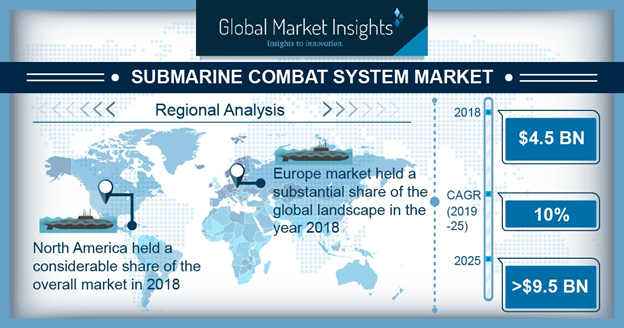 Submarine Combat Systems Market size is estimated to exceed USD 9.5 billion by 2025; according to a new research report by Global Market Insights, Inc. The governments across the globe are focusing to enhance and enlarge maritime warfare capabilities in their naval fleet. The rising political disputes among countries, development of advanced submarine system, and growing requirement to modernize the weapon systems will drive the submarine combat systems market. Additionally, growing usage of fast attack submarines coupled with advantages offered by this system such as stealth capabilities and faster operations will support the market growth. The industry participants are investing in R&D to introduce new technologically advanced software solutions including integrated ship control management and monitoring system (ISCMMS). Multiple countries are upgrading these systems to enhance the performance of submarines. For instance, in March 2018, Saab signed USD 17.21 million contract with Australia to provide ISCMMS for Australia’s Collins class submarines. All these will further support submarine combat systems market growth. However, the high upgradation and maintenance costs of combat systems may hinder the market growth over study timeframe. The SSK submarine segment will showcase significant growth in submarine combat systems market owing to submarine modernization plan of several countries. SSK are compact, agile, and less noisy as compared to their counterparts. Additionally, industry players are securing contracts from governments to equip their submarines with latest weapons. For instance, in June 2018, Leonardo secured contract from Italian navy to equip their U212A class of SSKs with Black Shark Advanced (BSA) torpedoes. These torpedoes are guided with fiber optic wires and integrates an energy production section for training or operational purposes. European submarine combat systems market share will hold dominance over the study timeframe. The dominance can be attributed to the purchase of new submarines and modernization of naval fleet by several countries. For instance, in 2016, the UK Defense Secretary approved the replacement of existing Vanguard submarines with four Dreadnought nuclear deterrent submarines. These submarines will be equipped with Trident D5 missiles and MK 48 torpedoes. Latin American submarine combat systems market will witness momentous gains over the study timeframe owing to upgradation of combat systems on existing submarine fleet as part of extensive defense programs. For instance, in 2014, Brazilian Navy announced to upgrade its four Tupi-class submarines with MK-48 torpedoes including extensive electronic refurbishment.